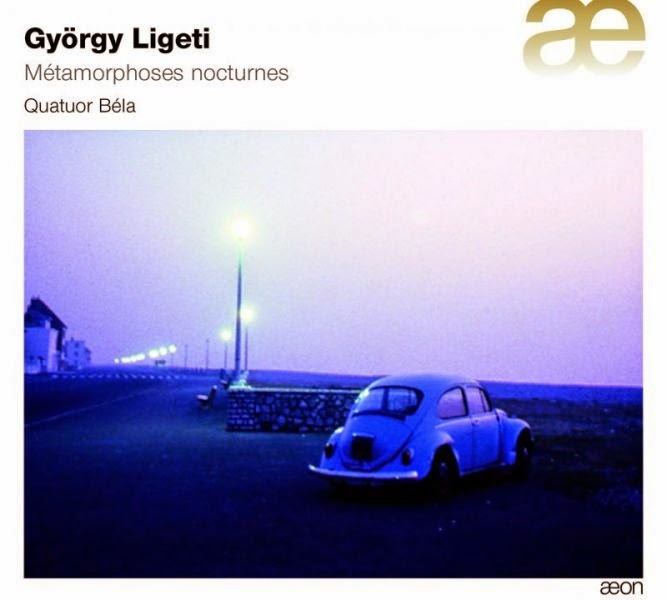 Quatour Béla has named its disc of Ligeti’s string quartets after the First, “Métamorphoses nocturnes.” That may seem a strange choice, given that the Second is the more iconic, and certainly the more historically significant, but it is apt, as the First Quartet is the real revelation here. That’s not to say that either the Second Quartet or the cello sonata is found wanting—the quality is exceptionally high throughout—but where other recordings of these works demonstrate a clear hierarchy, the Béla’s account presents the First Quartet as fully the equal of its successor. The quiet and mysterious opening of the First Quartet rarely taxes performers, and from the opening bars alone it would be very difficult to separate out the great recordings from the also-rans. But then comes a sudden sforzando, and rarely have Ligeti’s shock tactics have been as effective as they are here. This account is all about contrasts, with the many sudden changes of tempo, dynamic, and texture presented as starkly and brutally as possible. And for all its undoubted sophistication, the work really responds to this approach. Its gradual unfolding—a metamorphosis by thematic transformation across a single-movement, 20-minute span—is punctuated and delineated by these outbursts. Even more impressively, the tonal control and balance between the instruments is always maintained, even at the loudest dynamics. There is lyricism here too, and a certain folk character to the quieter melodic music, but that isn’t really the priority for these players, who sensibly avoid over-interpreting the more naïve passages. The Ligeti quartets are now well served on disc, particularly by young ensembles specializing in new music, and Quatour Béla follow in the footsteps of similar groups in recent years, including the Artemis , Parker, JACK, and Keller Quartets. Although I won’t claim to have heard them all, I will express a preference for a more senior ensemble, namely the Arditti Quartet, whose 1994 recording (Sony 62306) has long seemed, to me at least, the definitive account. This new recording is the first I’ve heard that seriously challenges the Ardittis’. But these are very different readings, and the qualities that Quatour Béla brings put both works in a different light. That sense of immediacy and total immersion in the First Quartet is as much a product of the sound engineering as it is of the playing. The recording quality here is exceptional, better even than that on the Ardittis’ account. The miking is not too close, and there is warmth to the sound, but each of the instruments comes through with absolute clarity, and the wide stereo array places each of them at a definite and separate point around your living room. The Second Quartet is given a reading just as fine as that of the First—though perhaps it doesn’t pull away quite as far from the competition this time, as the Second is the work that most other ensembles give the greater attention. But, again, the wide dynamic range, the excellent ensemble, the responsiveness of the players to the composer’s sudden changes of direction, and the crystal-clear audio all add up to make for a compelling account. The pizzicato third movement is particularly impressive. Unlike the Ardittis’ recording, where the more homogeneous sound makes the gradual phase shifts sound like a single, increasingly dysfunctional mechanism, the autonomy of the individual players granted by the superior audio here instead gives it a more heterogeneous character—makes it sound more like chamber music. Conversely, the brutality of the cluster writing in the fourth movement is all the more oppressive for the unity of intent the players display, and again for the immediacy and clarity of the recorded sound. It’s not a perfect account, and in one or two crucial regards the Ardittis’ retain the upper hand. Much of the writing in the outer movements involves pp, sul ponticello, tremolo effects on artificial harmonics, and in my experience, only the Ardittis’ can make that sort of device sound truly musical. There is also a sense of poise lacking, a common failing with many younger ensembles approaching this music, but again something that makes the Arditti Quartet stand out. The last movement in particular needs to express a paradoxical mix of languorous stillness and episodic progression. And then it needs to disappear off at the very end, melting away in one of those scurrying tremolo effects. Quatour Béla doesn’t quite manage either, and so the conclusion loses some of its effect. That’s a minor criticism though, and is the only thing that keeps this recording from taking the top spot from the Ardittis’. The two works together come to about 40 minutes, and choosing a filler can be tricky. This time round, the Quartet’s cellist, Luc Dedreuil, gives us the early Sonata for Solo Cello. This too is a fine reading, although of a much more straightforward work. Again, the sonics are excellent and the playing is both committed and engaging. An excellent recording all round and highly recommended, especially for the First Quartet, which, these players conclusively demonstrate, is anything but juvenilia. This review appears in Fanfare Magazine, issue 37:6.